You can also check out these cute cartoon animals on the web at cuddlycritters.net, and visit our Cuddly Critters online store! Meet Cuddly Critters artist, storyboard artist / illustrator Tim Holtrop! how many more can you make? Enjoy! by clicking on the "PRINTABLE" button below. 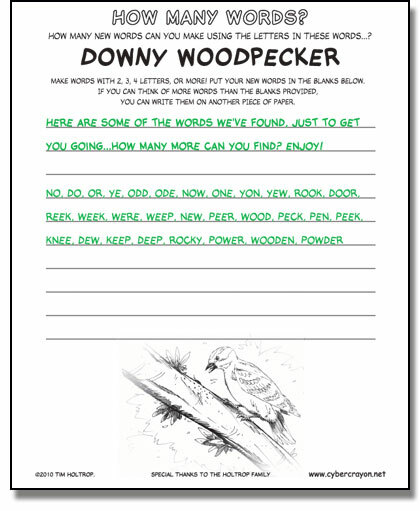 Beside bugs, what else do Downy Woodpeckers eat? All content is ©2009-2017 Tim Holtrop or the respective copyright holder(s). Free content is for personal, non-commercial use only. Regarding the printing of multiple copies of the free printable activities (PDFs): Special permission is given to parents, teachers, and others who manage children to print these activities in the quantities needed for their use in homeschool environments, classrooms, camps, clubs, ministries, daycares, and the like as long as the printouts are provided for free and are not sold, and the copyright statement, website address, and other included information remains on the digital files and printouts. Commercial use of site content is not allowed without a license and/or written permission from the copyright holder. For commercial use of content, please contact Tim Holtrop with your request. Thank you! Tim Holtrop is a participant in the Amazon Services LLC Associates Program, an affiliate advertising program designed to provide a means for sites to earn advertising fees by advertising and linking to amazon.com and/or endless.com.